We welcome Ellie Irons, an artist and educator based in Brooklyn, NY, as a guest on the blog . . . click for her own website, or see her bio under the “Who we are” tab. 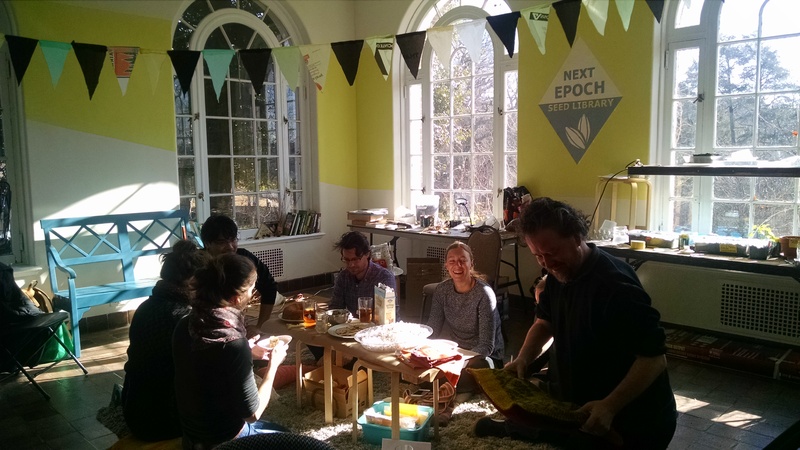 Seed sorting and packaging at the Next Epoch Seed Library winter headquarters at Wave Hill, January 2017. It’s mid-January 2017. Two of my collaborators, Christopher Kennedy and Anne Percoco, and I are hunkered down in our winter studio, stuffing seed packets for the Next Epoch Seed Library and reading passages from Michel de Certeau’s The Practice of Everyday Life. We’ve been out protesting on and off all week, and the inauguration and the Women’s March are looming. As we sort seeds from chaff and drop them into glassine envelopes, we muse on the efficacy of protest, and what our strengths are as socially engaged, environmentally oriented artists. Handling the seeds takes me back to the summer months of harvesting, and reminds me how life-affirming it was to move through urban public space with a group of fellow foragers, movements orchestrated by the gestures necessary to gently remove seed from plant. A moment later Anne remarks on the latent power held in the weedy seeds we’re sorting. They’re ready to resist whatever the city throws at them come spring. Chris wonders aloud what a league of wild-plant lovers might do to throw rocks in the gears of the patriarchy. And so Weedy Resistance was born. At the moment we’re gathering pebbles: amassing the pieces of an open source, collaborative platform for exploring “multispecies tactics for a shared world” within the human and more-than-human communities we have access to here in New York City. Formed organically and with many entanglements, we’re pleased to be a nebulous gathering of associations, interests, and conversations spread across disciplines, institutions and interactions. For me this all started years ago, when I was a frustrated studio painter, recently transplanted to New York City, and casting about for a new creative outlet. Searching for something that would ground me in the city and revive my creative practice, I began to wander the city’s liminal zones, climbing into vacant lots and exploring decaying parking lots. That something I was searching for presented itself in the form of spontaneous plant life: a broad assortment of easily overlooked photosynthetic life forms who have entangled themselves with humans and are often written off as weeds. 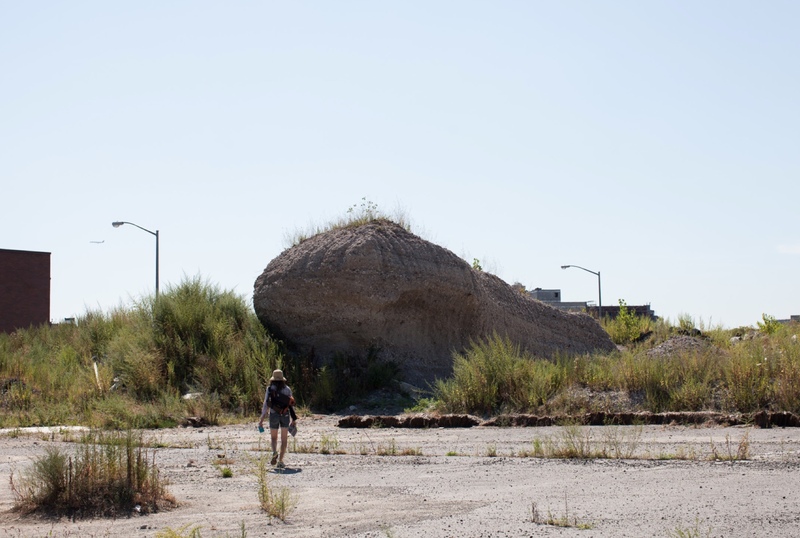 The author collecting seeds at the site of the first iteration of Chance Ecologies in Hunters Point, Queens, July 2015. This location is now under development and no longer publicly accessible. Photo credit Dan Phiffer. It was around this time, as I was getting to know my city’s spontaneous plant population, that I first heard the term “Anthropocene”. It struck me immediately. I was both intrigued and wary: fascinated by the geological implications and the epistemological possibilities, but troubled that it drew in its wake tag lines like “Age of Man”, which, as a feminist and skeptic of an anthropocentric, progress-driven world view, I strongly rejected. Since that time my relationships with the Anthropocene concept and the world of weedy plants have evolved in tandem. Both pursuits have led to me to connect with communities of engaged, critical people who are passionate about the biosphere and humanity’s place within it. While the Anthropocene dialogue provides a broad, abstract framework for engaging with deep time, global futures, and cumulative human impact, attending to weediness grounds me in the here and now, asking me to look closely at the more-than-human lifeforms with whom we’re co-creating our immediate habitats. From these beings, I’ve gained a new perspective on the absurdity of separating humans from the rest of the biosphere. And I’ve learned that weeds are good at resisting all sorts of things, from lawnmower blades and herbicides to binary categorization systems and calcified notions of human exceptionalism. It’s taken a little while for me to reconcile these two strands of my intellectual and creative life, the global and the hyperlocal, but of late they have come together. Documentation of “Green Borderland” a performative intervention developed by the author in collaboration with interdisciplinary artist and choreography andrea haenggi, August 2015. Photo credit Dan Phiffer. This convergence has in arisen in part thanks to the efforts of a range of thinkers who’ve made fertile ground of the Anthropocene conversation, using it to stage pushback against reductive, singular notions of “Man” and “Nature”. From formative writers I’ve thought with for years, like Donna Haraway and Anna Tsing, who’ve provided an essential new lexicon (Haraway’s Chthulucene, Tsing’s disturbance ecologies) to many, many newer-to-me thinkers coming from disciplines ranging from anthropology to sociology to plant ecology, reading has provided indispensable context and motivation for my continued examination of environmentalism and conservation in the face of global climate change. Chance Ecologies gathering at NESL’s winter headquarters, January 2017. Photo credit Anne Percoco. These exciting theoretical leaps struck me deeply due to their confluence with the embodied learning I was experiencing alongside a multispecies community of plants, artists, foragers and gardeners. Starting with walks, workshops and public fieldwork associated with projects like Invasive Pigments, and growing into longterm collaborative work like the Next Epoch Seed Library, Chance Ecologies, and the nascent Environmental Performance* Agency, working closely with wild urban plants and the humans who are attentive to them has been a revelation. It’s allowed my collaborators and me to recognize that we’re at the beginning of a long process: eroding the myth of civilization defined against wilderness, handed down over centuries of settler culture, will not be easy or comfortable. There is talk of invading species, blacklisted plants, brown snails…botanists even talk of keeping genotypes ‘clean’…The implications of an ill-thought-through conservation strategy are immense in terms of what it means to be human. Nationalism is represented in the ways we equate national identities with flora – we talk of what belongs within national space, even if plants grow over several continents. Plants have no national or political borders….I would like to see a mixed ecology – one that is still evolving, moving, migrating – rather than one contained in some botanist’s obscene concept of purity. 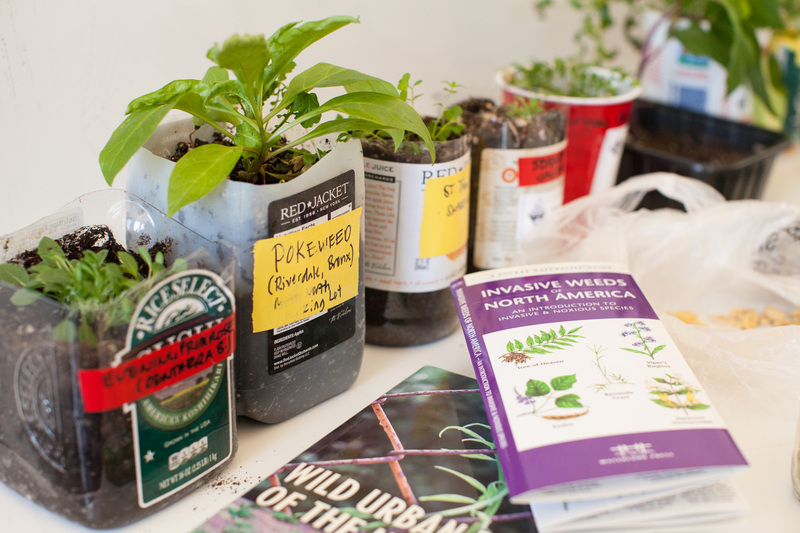 Wild urban plants (sprouted from seed as part of NESL’s seed viability testing) attended the first gathering of Weedy Resistance, hosted by the Parson’s Transdisciplinary Design Studio. Photo credit Dan Phiffer. As he read this passage, the audience consisted not only of thirty or so humans, but also an assortment of about fifteen wild plant species that thrive in close association with dense populations of people. They sat quietly around the edges of the room near the windows, spikey sow thistle (Sonchus oleraceus) bursting exuberantly out of a repurposed yogurt container, morning glory (Ipomoea purpurea) sending tendrils up a makeshift climbing structure of cardboard and electrical tape. Anne Percoco at the first Weedy Resistance gathering, reading passages from “Making Do: Uses and Tactics”, from de Certeau’s The Practice of Everyday Life. Photo credit Dan Phiffer. 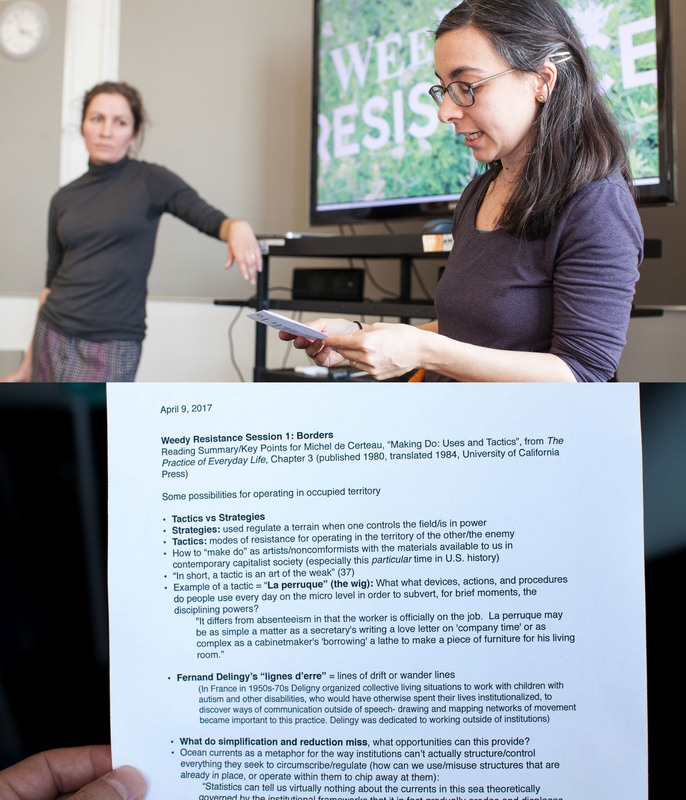 As we humans made our way through an afternoon of discussion, with topics ranging from energy democracy and adventure play to environmental nationalism and the border wall, we returned repeatedly to the question of what plants and ecological systems might have to teach us about political resistance and cultural intervention. We asked questions like: What can we borrow from our more-than-human neighbors? How can we cultivate more reciprocal relationships among humans and plants in urban environments? What do we miss in our ongoing “plant blindness”? The plants didn’t answer in any language our human cohort was capable of sensing, but I’m quite sure they were chattering among themselves. The human conversation, with presentations by Zhaleh Afshar, Oliver Kelhammer, and Eve Mosher, was recorded and archived. We’ll do the same with our upcoming gatherings in May (Networks) and June (Flux), and anything else that pops up in between. This archiving and sharing is another essential aspect of Weedy Resistance. It’s part of a commitment to openness, participation and iteration. Like a good weedy super-organism, we hope to see the seeds and spores of these gatherings carried far and wide. We make no artistic or intellectual claims on this endeavor. The ingredients for this coalition are pre-existing, dispersed, and cumulative over time, some free floating, some already linked. We simply hope to provide a few more nodes around which networks of resistance can coalesce in this challenging period. Finally, we offer this loose coalition as a tonic against another damaging myth: that of the isolated artistic genius acting alone in their own interest. We refuse this fallacy: it is impossible to act independently, as artists or beings, now more than ever. If we New Yorkers hope to truly inhabit the world invoked by Haraway’s naturecultures, acknowledging the agency of weeds, as both allies and instigators, is a good place to start. A series of photographs from the author’s ongoing “Feral Landscape Typologies” project: The Rise, Fall, and Rise Again of a “Vacant” urban lot, May-October 2015. This entry was posted in Reflections and tagged activism, Anthropocene, art, botany, nonhumans, plants. Bookmark the permalink. Thanks for this wonderful post, Ellie. It seems that Weedy Resistance is pulling the art/ecology/politics discussion — and the more general imperative to resist — in precisely the right sort of direction. A collectively directed pedagogical space profoundly open to unprecedented possibilities seems crucial given that, while we know that we as a species are not doing the right sorts of things, we also do not know exactly what we are supposed to be doing or, more to the point, we do not know how best to resist effectively, so thinking in unconventional ways is particularly important. If that conversation can configure itself to include plants, that’s terrific, since it seems that humans talking to humans only gets us so far (i.e. to recognition of the imperative but not to the most efficacious ways of responding to it) and plants, especially weeds, have much to tell us. They think, if that’s the right word for it, in ways that we perhaps should too, and they resist with such seeming ease. It also strikes me that learning from plants opens the door to a profound capacity for miscommunication (in our terms, across biological kingdoms, though whether plants have similar conceptions seems highly doubtful), so I wonder how a conversation happens between people and plants (rather than two simultaneous and parallel conversations going on) in full recognition of this inevitability. What we might see as resistant, plants might not, and vice versa. Maybe, though I don’t really know, some of Jacob von Uexküll’s ideas about the concept of Umwelt (https://www.upress.umn.edu/book-division/books/a-foray-into-the-worlds-of-animals-and-humans) can be expanded or modified to apply in the cases of plants: do plants have worlds? If not, what do they have instead, are we a part of it, and do we also have it (perhaps without knowing it) or are we radically excluded from it? Speculating about all of this might not make for the most rigorous science, but there seem to be whole aspects of existence where something like art might help us to envision ways to live with plants in shared resistance. Hi Robert! Thanks for reading, and for the thoughts and comments. I agree- questions around how plants experience the world are fascinating, and certainly relevant to what we’re thinking about. Certainly the Umwelt concept is a useful lens- one thing that we’ve talked about that strikes me in terms of this idea is that plants have this whole world that happens underground, in a world that we don’t really have access to most of the time, or even the senses to explore the way they do (root tips make decisions, distributed intelligence!?). What we see above ground, and see as the most “charismatic” part of the plant is only half of it, or really less than half in the case of perennials or trees, whose roots live on and on while the above ground portion can die off and regrow repeatedly. Anyway, much to think about! And thanks for sharing my walking work with your students! yeah, it really depends on how it’s framed! Weedy insistence is nice! I then think weedy “persistence”, and then we’re right back to resistance! Dialectical dance here. Of course it’s complicated, but one way I see such plants is as a symptom of the situation the land/ecosystem is in, often due to the legacies of human engagement with it (colonial/agricultural/industrial)- species like these are pushing back on our actions, responding more vigorously to disturbances of all kinds. This creates escalating “taming cycles” (Victor Wallis’ term via Jason W. Moore), in which attempts to manage landscapes in a dramatic fashion that sets humans outside of nature begin to backfire more and more explosively. Does/should “decolonizing” extend to plants? Slippery slope of which I’m pretty wary, although certainly an interesting question to ask- comes right back around to questions of population control, eradication that are soooo problematic when applied to humans. I’m going to a decolonizing the Anthropocene meet up soon & will put some of these questions out to the group! Question: are some plants considered weeds non-natives? I’m thinking of the famous cases like kudzu and purple loosestrife–other examples slip my mind. As Ellie notes, there is certainly an intense danger here–explored by Mark Sagoff and Emma Marris–of adopting a “nativist” stance. But since one entry into the “when did the Anthropocene begin” sweepstakes is the “Columbian Exchange” (where organisms were transported/transplanting across the globe), can at least some “weeds” be seen as legacies of colonialism, in effect allies of settler cultures–obviously the case with crops and ornamentals, but perhaps also with fellow-traveler species (actually, I think Leopold hints this might be the case with Kentucky bluegrass a few paragraphs into “The Land Ethic” . . .). I love this so much. Like you, Ellie, I get a lot of inspiration and energy from spontaneous urban vegetation. I hadn’t connected this explicitly with political resistance, but now you have–forgive me–planted a seed and I have some thinking to do. I think one lesson we can learn from the weedy landscapes of our cities is that ecologies don’t sit around waiting to be told what to do by ecologists or other people in power. They just grow, reproduce, multiply, exist. We don’t need to ask permission either. I do think we need to be very careful about analogies between plants and people. The intense hatred of non-native species many ecologists feel could be analogized either as a cruel, xenophobic anti-immigrant stance or as a kind of righteous de-colonizing. It all depends on the frame. The real challenge is perhaps to see the plants as they are without any political baggage, as plants just being plants.